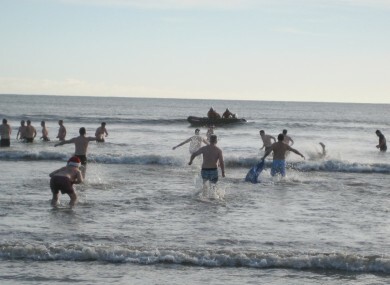 DEDICATED SWIMMERS BRAVED the cold in Garryvoe yesterday to go for a dip in the sea – all in the name of fundraising. The 20 swimmers were there to raise money for Ballycotton Lifeboats, its PRO Bláthnaid Lane Walsh told TheJournal.ie. “We hope to raise a few hundred euro,” she said. The annual Ballycotton Lifeboat Christmas Day swim took place at Garryvoe Beach in East Cork and all the money goes towards the lifeboat. Interestingly, most of the people who took part in the swim had no connection with the lifeboat, said Lane Walsh. They included a 12-year-old girl from Ballincollig who told her mother she wanted to raise money for the lifeboat, and a man from Midleton who chose the organisation to give money to from his swim. “It’s amazing how it comes about,” said Lane Walsh. She said that the lifeboat has dealt with about 15 shouts in 2012, and noted that people “are more conscious of the sea and take great care of the sea”. Ballycotton Lifeboat has a volunteer lifeboat crew of 20 and a fundraising committee. Lane Walsh wanted to thank all who have supported the Ballycotton Lifeboat in the past year, all the swimmers and those who donated. Without them we could not survive. Email “Swimmers brave the sea to raise money for Ballycotton Lifeboat”. Feedback on “Swimmers brave the sea to raise money for Ballycotton Lifeboat”.